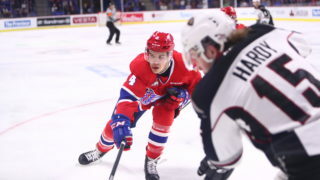 SPOKANE, Wash. — The Spokane Chiefs advanced to the second round of the 2019 WHL Playoffs with a 4-1 win over the Portland Winterhawks on Saturday night at Spokane Arena. 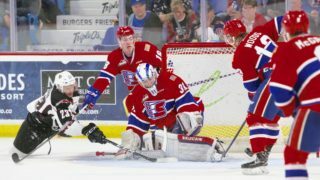 Spokane won the series, four games to one. The Winterhawks got on the board first, taking advantage of a misplayed puck behind the Chiefs’ net to score shorthanded and make it 1-0 at 4:04. Vegas Golden Knights prospect Cody Glass – who missed the first four games of the first round series – was able to push the loose puck into the open goal. 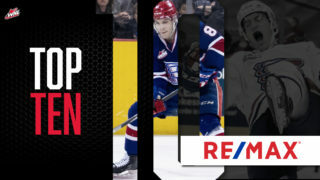 Spokane responded quickly, scoring on the same power play chance as Nolan Reid found a seam from the left point to Luke Toporowski inside the right circle. Toporowski one-timed the puck inside the post and past Portland goaltender Joel Hofer at 4:52, evening things up at 1-1. Toporowski lit the lamp again late in the period, scoring his fourth goal of the playoffs to make it 2-1 with 2:08 remaining. Reid once again earned an assist on the play as he chipped it behind Portland’s defense to spring the breakaway chance. | Chiefs win game & series vs. @pdxwinterhawks, advance to face @WHLsilvertips in second round! After a scoreless second period, the Chiefs broke through again 1:28 into the third as Riley Woods forced a turnover in the Portland zone and ripped his third of the playoffs top shelf to make it 3-1. It was a repeat performance under two minutes later as Woods spun around the left circle and threw a shot on goal that trickled past Hofer to make it 4-1. 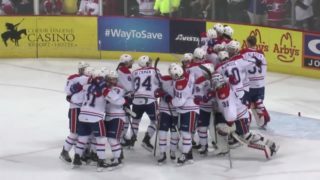 Spokane shut the door late to close it out and earn their first playoff series victory since 2013, when they beat Tri-City in the first round, 4-1. 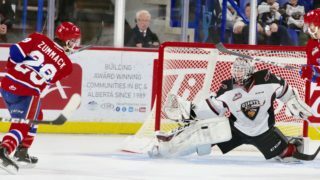 Bailey Brkin started in goal for the Chiefs and turned aside 38 of 39 Portland shots. Hofer finished 31-for-35. Spokane went 1-for-2 on the power play and 4-for-4 on the penalty kill. 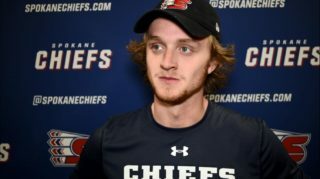 The Chiefs will face the Everett Silvertips in the second round of the playoffs, beginning with Game 1 in Everett on Saturday, April 6. Spokane will host Game 3 on Wednesday, April 10 and Game 4 on Friday, April 12 at Spokane Arena. They’ll also host Game 5 on Saturday, April 13 if necessary. Tickets for the second round are available now online and will be available via the Chiefs’ Ticket Office beginning Monday, April 1 at 9 a.m.